I am on a heirloom tomato kick and mostly I just eat them by themselves, sometimes with just a touch of salt. To put some tomatoes into my hubby's tummy I had to be creative and I decided on a pizza. 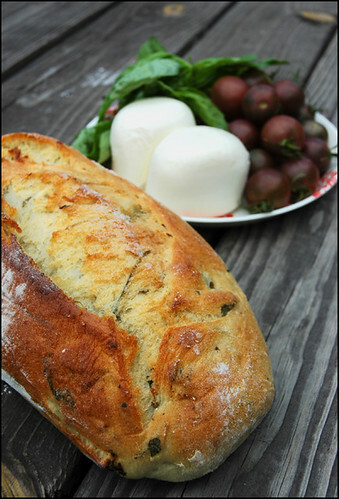 Except, I didn't feel like making the dough for a weekend lunch, plus, I got such a beautiful loaf of artichoke and spinach bread at the farmers market. I decided to fake a pizza with it. 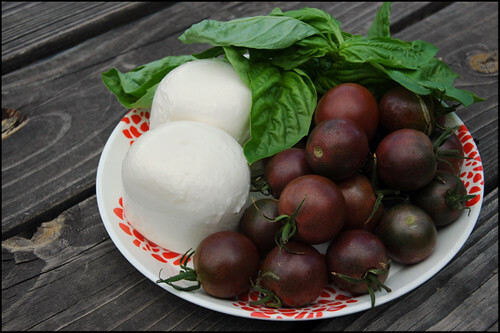 A caprese pizza, since I also got fresh mozzarella and a bag of fresh basil. Instead of tomato sauce under the mozzarella, I decided to make a basil butter, lately I'm not the biggest fan of tomato based pizza sauces. This was really a delicious and fresh lunch! Preheat your oven on 425 degrees. Finely chop your basil (reserve 1/4 of it to top the pizza)and mix it in with the butter, or blend it together in your food processor. Spread generously over your bread pizza base. 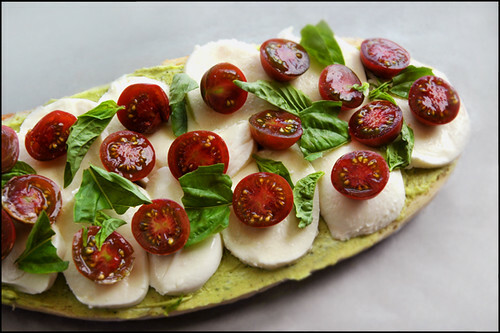 Cut mozzarella in slices and spread over the top. 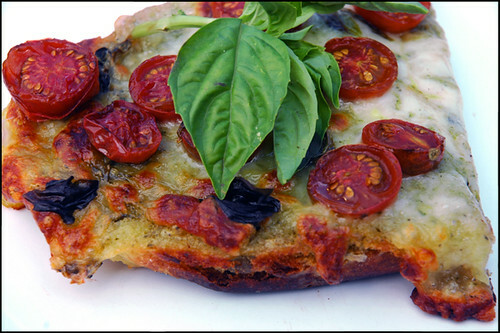 Cut tomatoes in half or 1/4" slices, depending what tomatoes you choose to use and spread some basil on it. Season with salt and pepper and put in the oven and bake for about 10 minutes, or until cheese is melted and nicely browned.